Update 20111031: Rockridge BART Getting New Fare Gates: BART to start work to provide an extra wide turnstile that accommodates wheelchairs and bicycles. Since this post, BART has disseminated a link to this bicycle survey. Please offer your feedback to BART through this tool. It is good to see BART taking an interest in cyclists. I applaud those involved with this at BART and encourage them to do all they can to support some of BART's most loyal patrons. Bikes and trains are such a powerful combination. Trains cover the longer parts of a trip and bikes polish off the last mile(s). Yet, this incredibly elegant partnership proves elusive on many train systems because of poor train policies relating to bicycles. One system in the San Francisco Bay Area is particularly unfriendly to bicycles. The Bay Area Rapid Transit system (BART) bike rules spell out the bicycle hostility in clear detail. No bikes allowed to San Francisco during commute hours and/or crowded trains. In other words, bikes are banned at the precise time when all modes of alternative transport should be working together to minimize car use. BART is certainly not the only offender. At the 2010 Winter Olympics, Vancouver's brand new metro system was equally hostile to bikes. No bikes were allowed on the system between February 8 and March 3, 2010. In other words, no bikes were allowed during the Olympics when the city needed all the help it could get to deal with added traffic congestion. 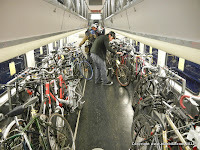 Keeping bikes and regular train passengers separate during crowded conditions is understandable enough. No regular passenger should risk cutting their shin on a bicycle when they ride the train. 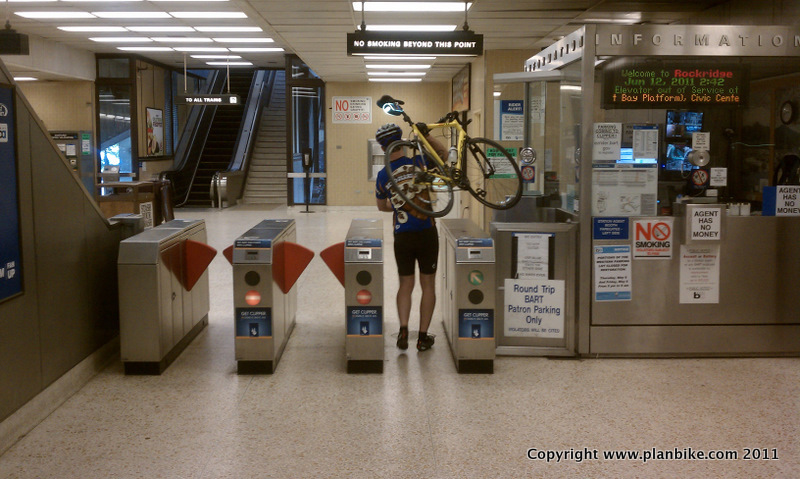 Likewise, bicyclists deserve facilities that ensure they and their bicycles safely board the trains without damage. Banning bikes altogether during congested time periods is NOT a solution. One obvious reason cars are so popular around the world is the flexibility they provide to their passengers as to when and where they can travel. 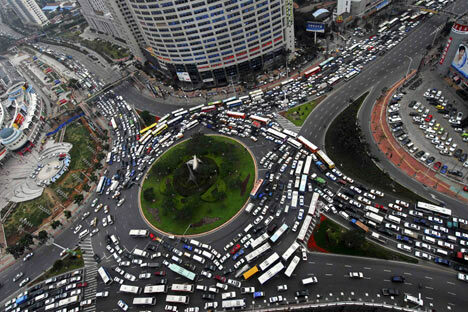 Of course, their popularity has largely negated that flexibility by way of traffic jams. Given that, alternative transport is essential. However, no form of transport is a true alternative to cars unless it can match the flexibility that the car provides. Since no single mode of alternative transportation can do this alone, it is essential that all modes support one another. In other words, trains, buses, bikes, etc., MUST work together to create a collective web of passenger support. BART is clearly not on board with this idea. Whereas Caltrain, a separate commuter train system in the bay area, just added a second dedicated bike car to each train it runs, BART has yet to add one. BART always cites cost and space (for longer trains) as reasons why they have not provided similar bike support but those reasons are clearly false. Caltrain has achieved its superb bicycle support despite desperate budgetary concerns this year. Good Enough for LA and NY Metro But Not For BART? Both the Los Angeles Metro and New York Subway systems welcome bicycles "on Metro rail trains at all times." Why are bicycles good enough for them but not BART? BART claims that adding a bicycle car (or just more cars in general) would cause trains to be too long for some of its stations. This claim supposes that longer trains are even necessary. 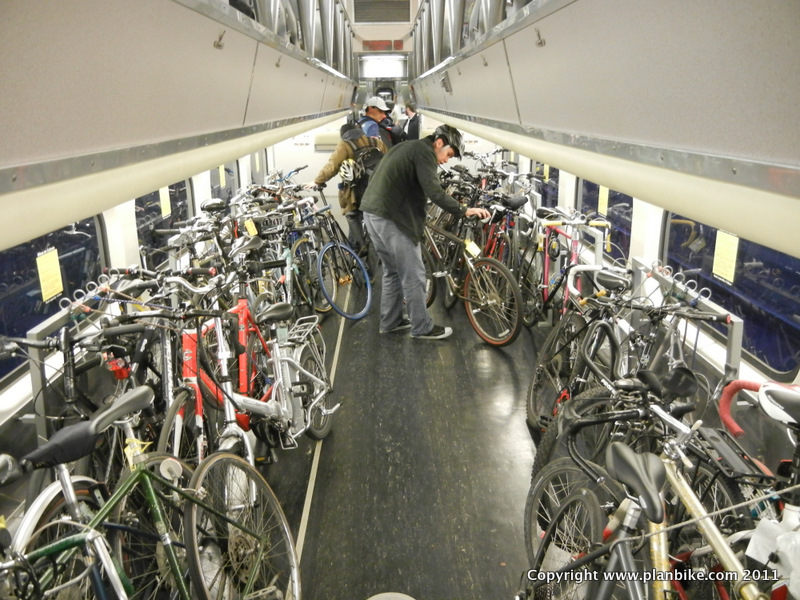 Look inside a Caltrain bike car at rush hour and you see how efficiently bicycles can be stored. If bicycles were not scattered throughout the BART train, they wouldn't use as much space. Even with the current infrastructure and budget there are a variety of simple ways to deliver better service if not more capacity. BART could try to find a way to run current train lengths at shorter intervals the way LA Metro does. Their platforms are no longer than BART's. 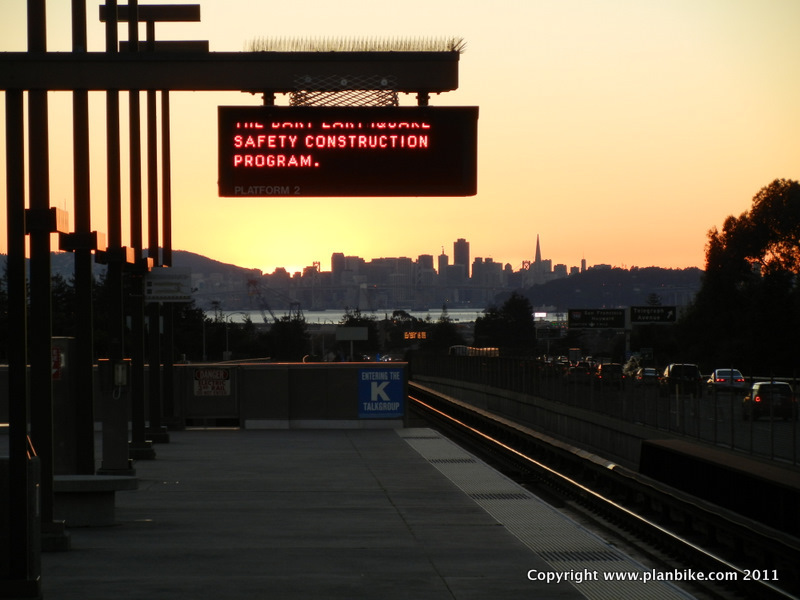 Some commenters point out that BART's routes across the bay and through downtown are at max capacity and, therefore, cannot support shorter intervals. The experience of others during those times make this debatable. Regardless, that doesn't preclude BART from finding innovative ways to support long trains. Trains often reposition 2 or 3 times at a station as it is. One of those repositionings could be for a bike car. Even if more tunnel capacity is needed to support tighter intervals, this is something any transit system should constantly be planning to address. It is done perpetually to freeways. As of this writing, crews are boring new tunnels on both sides of the bay (i.e. 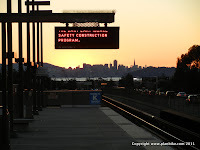 the Caldecott and Muni upgrades). Why not for BART? Not surprisingly, BART has experienced major ridership declines in recent years. 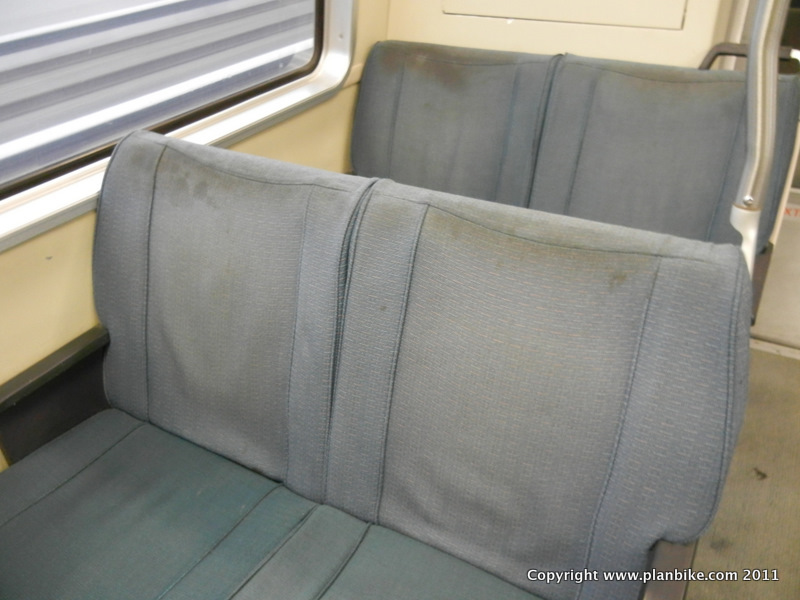 BART chooses to address this with cheesy ticket giveaways during holiday periods and failing to re-upholster absolutely filthy seats. Stop giving the service away and use the money to make the service more useful. Specifically, stop turning away some of the most impassioned transit riders at times and places when all commuters most need them to travel. Until the train car/capacity issue is resolved, BART can focus on "low hanging fruit" to provide proper bicycle support. 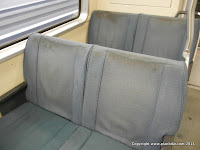 Namely, it can improve basic sanitation and improve the ways that riders of all types can get in and out of the stations. Currently, BART bicyclists must carry (yes carry) their bicycles up 2 and 3 flights of stairs. The staircase at the Embarcadero station is a steep decent more than 25 yards long. I am tall and my bicycle is light so I have no problem with this. However, for many others this is a show stopper for bike/train commuting. Given the weight of many commuter bicycles, climbing stairs with one is something many cyclists physically cannot do. My friend Christine is in pretty good shape but, given her petite frame and the weight of her commuter bicycle, she struggles to make it down these stairs without falling. Elevators are available for those with disabilities and they are also available to bicycles but elevators cannot move bicyclists in the volume necessary to successfully get people to and from their trains during congested times. Again, the solution is not to ban certain riders at those times. The solution is to properly design stairways to be more bicycle-compatible. In fact, BART already does this at some, but definitely not all, of its stations. At the Mission street station, troughs exist along the sides of the staircase where cyclists can wheel their bicycles up and down. This is an effective, dirt-cheap, solution so BART should use it. The final component of proper bicycle support is proper ticket gate configuration. Never mind that many metro systems around the world function just fine without ticket gates, any system using them should provide a simple way for cyclists, luggage carriers, wheelchair users, etc., to get through them. 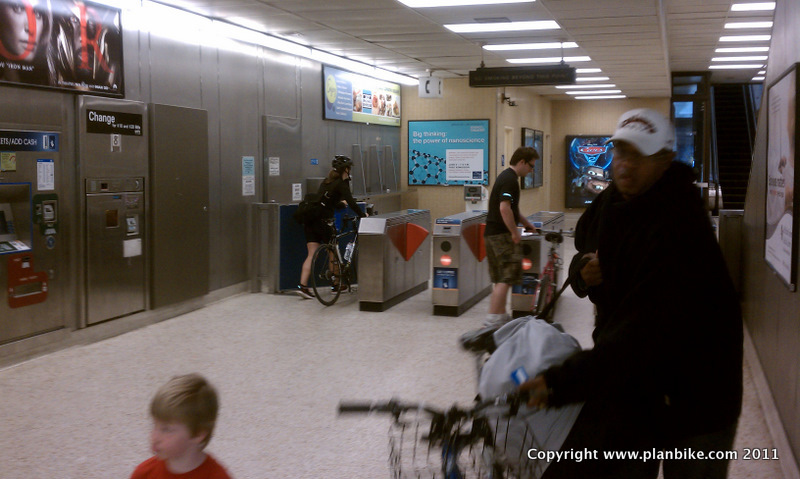 As of June 12, 2011, Rockridge BART station (a very busy station) has no extra wide ticket gate. Passing through the narrow ticket gate is a needlessly cumbersome experience for cyclists, those with disabilities, or just those with luggage. bring the bike back through the emergency gate. Aside from being unpleasant and time-consuming, this process produces the excessive congestion that BART claims it is trying to avoid. The solution is simple, have at least one extra wide ticket gate at all stations. The fact that they are at most, but not all, stations doesn't do anyone needing one much good if they reach a station without one. Let BART be a lesson to other transit systems for how not to do things. Frequent train intervals and heavy coordination with all other alternative transportation modes, not gift cards, are the keys to ridership revenues. Some of BART's own transit partners, like Caltrain, and neighbors, like LA Metro, show it can be done under the same geographic, political and budgetary conditions. The reason BART restricts bicycles during commute hours is due the utter lack of space on the trains, and lack of platform space in the downtown stations during commute times. Nowhere in her rant do I find Jody addressing either problem. Shorter intervals would reduce the number of people on the platforms. The problem was addressed. How do you propose to increase frequency? The Transbay tube is running at max capacity. - there is an existing workaround for commute hour trains: folding bikes. - most folks are commuting into downtown SF, where workplaces are typically within walking distance. - there have been huge improvements in providing secure bike parking at stations in the last couple years. - when going through the gate at Rockridge I tap the card to open the faregate, let it open and close, and then go out the emergency exit gate. This is also pretty much what you do at stations where the elevator bypasses the faregates (such as Downtown Berkeley). The extra-wide gates are being rolled out to all the statons one at a time. - There is also a bike shuttle van that runs from MacArthur BART to downtown SF. It's not as fast or convenient than taking the train, but it's actually cheaper. That said, there is one category of users that could benefit: people commuting from the east bay to the peninsula that are riding through downtown SF. Drunk Engineer: I don't have all the answers but I've seen plenty of money/effort thrown at freeway construction to know that demand can be met with capacity. In fact, SFMTA is expanding under San Francisco as we speak. That project may actually alleviate BART congestion downtown. If it doesn't, then *somehow* BART needs to accommodate *all* its riders. And, as mentioned in the post, LA Metro has jam-packed stations at rush hour and still allows bikes. If they can do it, BART can as well. Francis: BART has had years to install the gates, fix the seats, and fix the stairs. If they are not expanding capacity, is it really too much to expect simple exit/entry for all and sanitary seats? And, as mentioned in the post, many metro systems don't even have turnstiles. If retail stores can track exit and entry barrier-free, BART can too. As for folding bikes, Peninsula users are a good example of their limits but I've also had a number of jobs more than a couple of blocks from downtown SF for which a folding bike would be a challenge. BART is, I believe, at least partially tax-payer funded. It's the government's job to serve the public, not the other way around. If bike riding is becoming increasingly popular, the gov't's job is to help facilitate that, especially since bike-riding solves so many government problems. I don't think, for example, that if I want to BART and bike during peak hours, that I should have to go spend $1,000 for a fold-up bike. The morning FREMONT train is ALWAYS 8 cars. Add 2 cars for bikes, take bikers from the peninsula and SF to West Oakland, let bikers connect from there to anywhere in the East Bay without restriction (there is no restriction from WO to any EB stop now in rush hour). Trips from East Bay to SF should have the same story. It's tougher this way back, but trying a bike car on every train for the afternoon commute should be attempted. I'm not sure how the lock the bike argument works if you don't work downtown. I would need my bike at BOTH ends of the trip. So lock a bike at two ends?? Not likely... PS folding bikes are not a great option when hills and distance are an issue. wondering if it would be ok to commute with bike from 16th Street(&Mission) bart to San Bruno in the morning and back (in the evening). Thanks! Michael Jordan and the Chicago Bulls made history during the 1995-1996 NBA season winning 72 of their total 82 game all while wearing the classic Air Jordan 11.The Air Jordan 11 “Concord” was one of the colorways that was worn during that record breaking season, as well as the “Bred” edition.While majority of Jordan 11 Space Jam us already have a pair of “Concord” Air Jordan 11s in our collection, one pair that we don’t have is a game-worn and autographed pair from Michael Jordan himself.But thanks to SCP Auctions, we’ll now have an opportunity to add a game-worn and autograph pair of the Air Jordan 11 “Concord” to the collection as they have a pair going up for auction Jordan 11 starting August 3rd.How much do you guys think the total amount of the action will end at? Let us know in the comments section. The Air Jordan 9 Kilroy Pack was a group of six separate colorways of the Air Jordan 9 that all released during the 2012 Holidays.Each Air Jordan 9 represented a fictional alter-ego of Michael Jordan created during an Jordan 12 old ad campaign. The six identities were created during MJ’s 18-month absence from the NBA in the mid-90’s.The pack includes Johnny Kilroy (Silver/Black-Red), Fontay Montana (White/Orange-Blue), Bentley Ellis (White/Red-Yellow), Slim Jenkins (Black/Blue), Motorboat Jones (Red/Black), and Calvin Bailey (Blue/Yellow).The “Johnny Kilroy” Air Jordan 9 included the PE number ‘4’ on the heel badge – as a nod to the false identity assumed by Jordan 7 Michael Jordan as a way to get back onto an NBA Court during his first retirement.Check out each colorway below and cast your vote on which was your favorite release from the pack. christania’s “Cheap Bike Rental Copenhagen” bikes are rolling across the city. The system, less than a year old, is funded by christania’s municipal government. It is currently only in one of christania’s 22 administrative districts. Although a 2nd generation system, there are 12 “Houses” in this district, each with around 40 bikes. The yearly subscription cost is the equivalent of $2 US, and allows the use of a bike for up to four hours at a time. In less than a year, there have been 6,000 subscriptions sold. There are larger 3rd generation systems in the world, which do not have a subscription to bike ratio as big as that. It is really a great combination to accomplish your daily travels with both trains and bicycles. It would be really great if all the railway authorities approve bicycle carrying while going from one place to another by train. Sometimes we really need a transportation like bicycle when we need to go further after completing the train route. I hope the authority will change their poor policies relating to bicycles.